Taipei Medical University (TMU) has been a leader in Taiwan’s healthcare system for more than half a century. Around 6,000 students from over 40 countries are currently enrolled in TMU’s 11 colleges. TMU leads in many research areas including translational cancer research, neuroscience and neurosurgery, biomedical devices and tissue engineering, cell therapy and regenerative medicine, and biomedical informatics. As one of the capital city region’s largest healthcare systems, TMU’s 3 affiliated hospitals – TMU Hospital, Wan Fang Medical Center, and Shuang Ho Hospital – are all accredited by Joint Commission International (JCI) to guarantee world-class standards and practices, providing ample opportunities for professional skills training and research. TMU’s education offers have expanded with the university’s commitment contributing to health service worldwide, accommodating interests of students from around the globe to develop area expertise and service their own communities. The permanent appointment of the university’s medical teams to assist the Kingdom of Eswatini and the Marshall Islands provides a unique opportunity for service and education, as well as enhancing Taiwan’s health diplomacy. TMU’s commitment to internationalization has resulted in over 40,000 alumni working to improve healthcare systems in 70 countries. 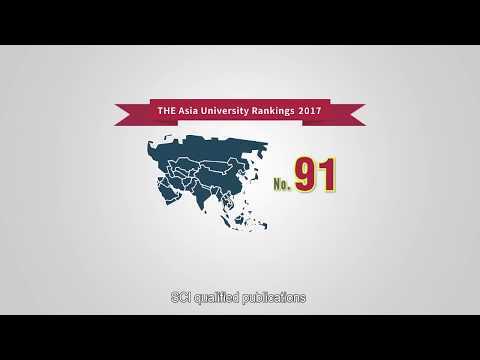 As the university approaches its sixth decade, TMU continues to change and advance in global rankings that have placed it at the front of Taiwan’s private universities in medicine and health science. The university is a few minutes’ walk from Taipei’s trendiest entertainment and shopping district; also nearby are the famous hiking trails on Four Beasts Mountain and Elephant Mountain. Reasonable living costs and safe streets make Taipei an ideal destination for students. The excellent public transit system includes a bicycle depot on campus and a subway line that is a few hundred yards away. TMU is committed to assisting new students to adjust to life at TMU. Information on campus life is available in English that can be easily accessed with laptops, smart phones, and tablets. Other facilities that offer convenience and entertainment include a food court, an on-campus copy shop, several convenience stores, a bakery and one restaurant. Sport lovers may visit our competition-size swimming pool with a large whirlpool spa, steam rooms and dry saunas, a weight room, table tennis room, and studio for yoga and other physical education classes. Support services for international students include several off-campus dormitories (shared apartment), free shuttle service between the campus and local transit stations, Chinese language training, a campus counseling center and well-furnished laboratories with bilingual training on the operation of all high-tech equipment. An extensive scholarship program assists most foreign students with their costs of study here. Other programs support international students in attending conferences, participating in competitions and taking internships aboard. Applicants are neither Taiwan R.O.C. citizens nor overseas Chinese. Applicants who had Taiwan R.O.C nationality must have given up their Taiwan R.O.C. nationality for 8 years or more and approved by the Ministry of the Interior Taiwan R.O.C. Counting back from the day of application, applicants must have continuously resided abroad for more than 6 years (8 years for School of Medicine and School of Dentistry applicants). Applicants of foreign nationality concurrently holding a permanent residence status in Hong Kong or Macao who have household registration history in Taiwan and who at the time of application have resided in Hong Kong, Macao, or another foreign country for no less than 6 years (8 years for those seeking training in medicine, dentistry and Chinese medicine). An applicant who was a former citizen of Mainland China and who holds a foreign nationality with no history of household registration in Taiwan, and who at the time of application has resided overseas continuously for no less than 6 years (8 years for those seeking training in medicine, dentistry and Chinese medicine). For more information, please refer to the Regulations by Ministry of Education. Email inquiries can be sent to [email protected].